The Good Water Guy’s Premium Ice and Water Dispensers offer unique benefits to enhance any home or business! Our 7 and 15 Series Ice and Water Dispensers help renew residential and business office aesthetics while delivering fresh, filtered water and chewable Chewblet® nugget ice. The Good Water Guy’s Sleek, attractive 7 Series and 15 Series ice and water dispensers come in countertop and freestanding models. 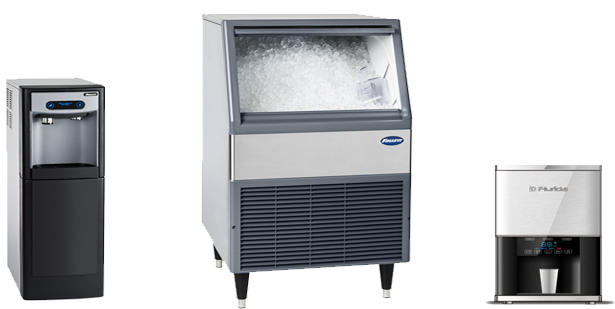 Additionally, the 7 Series is available in undercounter models that can easily replace open bin undercounter ice machines that require scooping by hand. All models have sanitary dispensing. These dispensers can produce 125lbs. of consumer-preferred Chewblet ice per day. The 7 Series, which holds 7lbs. of ice storage, is ideal for a 25-30 person work group while the 15 Series holds 15lbs. of ice storage and is ideal for serving up to 50 people. We can provide you with great ice machines that produce chewable ice from incredibly rugged and safe machines that use Anion technology so that bacteria concerns are eliminated.